Sure, your old hardscape may be cracked, split, or fractured, but it could still be strong enough to provide the foundation for a beautiful new piece of pavement. Why rip up a solid foundation just because it's starting to wear down? There are plenty of reasons to restructure your worn-out overlay pavement, by using it as the foundation for a vibrant new hardscape. Here are some benefits of using overlay paving. Cost: Cost is a factor in any construction project, big or small. Save some of that budget for other areas of the construction and save yourself or your client a mint. Overlay paving reduces costs overall since the structural foundation is already present. Environmentally-friendly: Using overlay paving prevents the existing structural foundation from being torn up and thrown into a landfill. Overlay paving is a greener, more environmentally-friendly option. Makeover: Using overlay paving is a fantastic way to breathe a fresh new aesthetic into the old pavement. 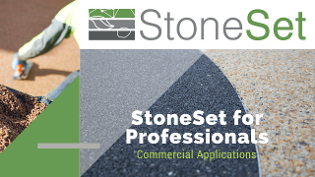 At StoneSet, we will work with you every step of the way when it comes to appearances. Typically, this involves custom advice on every structural and aesthetic option on what you can do with our product. Curious? Check our image gallery on past projects we've run. Bases: You don't necessarily need a concrete foundation. We have worked with all types of bases during our many years doing overlays. Are you working with a driveway made of metal and want an overlay? We've seen it, and we've done it. In-and-out: StoneSet overlay paving is quick. We can be in and out before you know it. We are fast, quiet, and with a curing time of just 24 hours for pedestrian traffic and 48 hours for vehicular, expect your project to be complete in a flash. Grip: We can't speak for all overlay paving on this one, but StoneSet's overlay paving is textured and thus provides a high grip rating. Our class V paving prevents slips and falls and grips wheelchairs with ease. If you are thinking about using overlay paving for an upcoming project, please feel free to contact us!